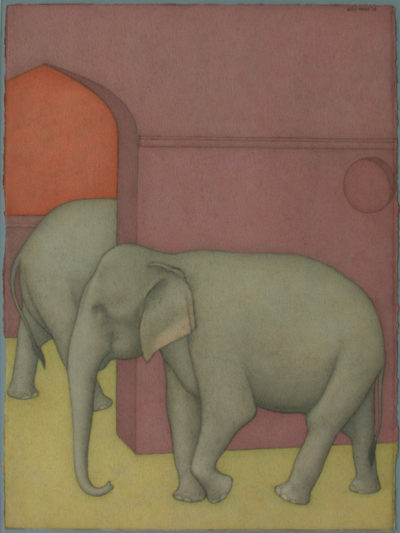 Shanti Panchal is a leading London-based Indian artist with an international reputation. He has won the 1991 National Portrait Gallery/BP Portrait Award, was Artist-in-Residence at the National Gallery in London in 1994, and was a 2003 nominee for the UK Asian Achievers Awards. During 2010-11 he was included in the Tate Britain initiated touring exhibition, and has had a painting commissioned in 1989 and recently bought a painting of his sons in Afghanistan by The Imperial War Museum. 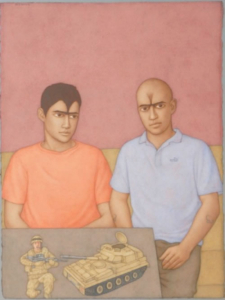 Born in 1951 in Mesar in the state of Gujarat, Shanti Panchal studied art at the JJ School of Art in Mumbai where he also worked on a fellowship for a year. Further study at the Byam Shaw School of Art in London a British Council Scholarship directed his future track that included a stint as artist-in-residence at the British Museum in London. 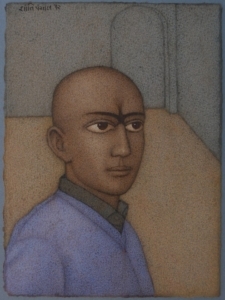 For over twenty five years Panchal has worked solely in watercolour not prepared to accept the conventional limits he pushes the boundaries of his medium, developing a unique way of using watercolour that is close to the art of fresco, building layer upon layer almost in a meditative state of being. The earthen colours of my palette relate to my early years spent in a village in Gujarat, Western India. It is strange but through these experiences I found myself inspired to develop a very personal visual language. In my paintings of the family in which I grew up, where western notions of privacy were absent, the characters manage to create their own inner space and the lack of privacy often highlights their essential loneliness. 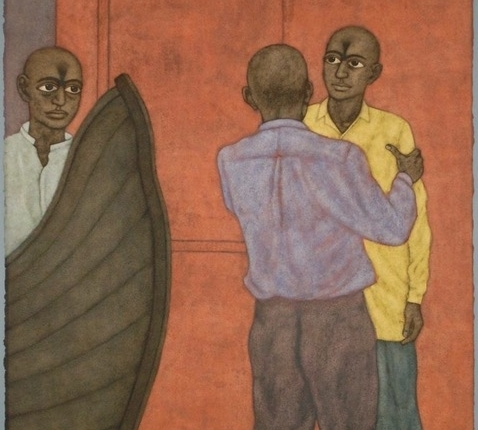 Many of Panchal’s paintings include graceful figures with large dark soulful eyes illustrating a personal vision suspended in time taking on an almost mythological atmosphere. In all of this artist’s compositions he creates a narrative questioning our place in the world, literally illuminating the everyday until it is full of beauty. He creates an intimacy which draws us closer to another culture and presents an insight into the artists mind. 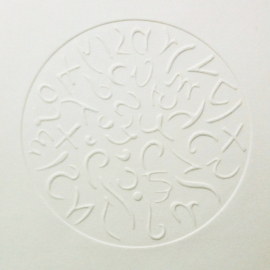 Shanti Panchal’s paintings are sculptures of light. They aren’t flat, still less shimmers across a screen. You need to see them in the flesh, in the same way you look at someone you love. Then you become aware of the thickness of the heavy, hand-made sheets of paper he works on, and their richly textured, absorbent surfaces. His is, primarily, a physical art. But the substance he is modelling, cutting into and shaping is not material; it’s nothing less than light itself. Panchal has developed a unique and remarkable way of using watercolour that is close to the (mostly lost) art of fresco, a method of painting on wet plaster so that the pigments become embedded in the wall. Panchal’s colours aren’t surface glazes illuminated, like a stained glass window, by the light of the white paper shining through behind them. His colours don’t flash with a quick smile across the surface. They stay still, breathe and glow. His art isn’t a river; it’s a lake. His aim is to slow life down, and dig deep. As we all know that there is State support to those soldiers who come back wounded, but many of them (only in their late teens) who return with their limbs intact, are disturbed mentally and emotionally and scarred for life. They are so traumatized with the experience of brutal war, unable to sleep well – often having nightmares, have lost contact with friends as they have been away for a while, unable to make a relationship. They are really lost and unable to adjust to normal life, for these men there is no State support or care of any kind as physically they appear to be normal and the fact is that they need help and I feel that these issues are not addressed. Therefore, I wanted to highlight the plight of these young man and their families who suffer in silence. 1. Shanti Panchal: Earthen Shades, Arts Council funded touring exhibition, curated by Cartwright Hall,Bradford and Castlefield Gallery, Manchester , touring to 10 venues across UK. 2002 Herbert Art Gallery and Museum, Coventry. 2003 Berni Gallery, Jersey Art Centre, Jersey, Channel Islands. Shanti Panchal: A Personal Journey, The British Council, Mumbai, touring to Jehangir Art Gallery and Cymroza Art Gallery, Mumbai, curated by Usha Mirchandani and Phiroza Godrej. 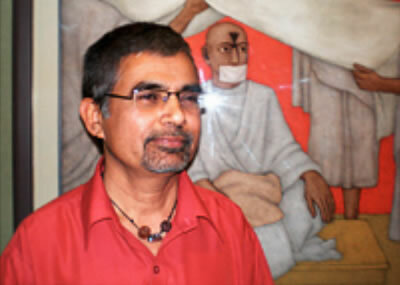 2006-07 Shanti Panchal: In the Mind’s eye, Chelmsford Museum, Chelmsford, Essex. 1982 Between Two Worlds, Barbican Gallery, London. 2002 Intimacy, The Lowry, Manchester. 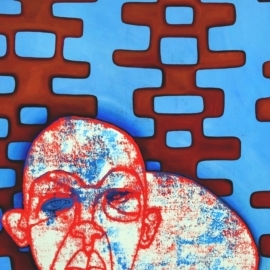 2003 Shantipath, Tao Art Gallery, Worli, Mumbai, India. 2004 Anticipations, Fine Art Resource, Jehangir Art Gallery and The Museum Gallery, Mumbai, India. 2007 Rigard and Ritual (two persons show) Ben Uri Gallery, The London Jewish Museum of Art, curated by Rachel Dickson & Julia Weiner, touring to 2008 CCi Space (university Gallery launch) Portsmouth. 2009 Royal Academy Summer Exhibition, London. 2009-10 Portrait Prize Winners, A Gallery, Wimbledon, London, curated be Beatriz Hernandes. 1985 Greater London Council, London. National Garden Festival, City Museum and Art Gallery, Stoke-on-Trent. 1989 Imperial War Museum, London. 1996 H. Goldie and Co Ltd for De Beers, London. William Packer,East End’s local brew, Financial Times, 28 January. Jenni Lomax and Nima Smith, Earthen Shades: Paintings by Shanti Panchal, catalogue essays, Cartwright Hall, Bradford and Castlefield Gallery, Manchester. Kaveri Ponnapa, Indian Images: the Paintings of Shanti Panchal, Swagat-IA Magazine, September. Marina Warner, catalogue essay, Shanti Panchal, Royal Festival Hall, South Bank Centre, London. Norbert Lynton, catalogue essay, Shanti Panchal: Private Myths, Pitshanger Manor Gallery, London. Sharmila Sagara, Profile: Shanti Panchal, the Times of India Ahmedabad, March 17. Two Distanced Figures for Blackburn Museum and Art Gallery, National Art Collections Fund, 2002 Review. Heather Wells, The stillness of being, Faith and the Artist, Initiative, issue 9, Summer. The British Council, Jehangir Art Gallery and Cymroza Art Gallery, Mumbai. Sushma Bahl, catalogue, Ananya, an overview of contemporary art, Visual Arts Gallery and Habitat Centre, New Delhi, India.